As Senior Fellow, Laura E. DeNardis will play a role in The Centre for International Governance Innovation's global security project on Internet governance. The Centre for International Governance Innovation (CIGI) is pleased to announce the appointment of Laura E. DeNardis as Senior Fellow. At CIGI, Dr. DeNardis will play a role in CIGI’s global security project on Internet governance. Dr. DeNardis is a scholar of Internet architecture and governance and an Associate Professor in the School of Communication at American University in Washington, D.C. She is an affiliated fellow of the Yale Information Society Project at Yale Law School and served as its Executive Director from 2008-2011. She is a co-founder and co-series editor of the MIT Press Information Society book series and currently serves as the Vice-Chair of the Global Internet Governance Academic Network. She has previously taught at New York University, in the Volgenau School of Engineering at George Mason University, and at Yale Law School. With a background in information engineering and doctoral training in Science and Technology Studies, Dr. DeNardis is an expert consultant in Internet governance and architecture to Fortune 500 companies, foundations, and government agencies. 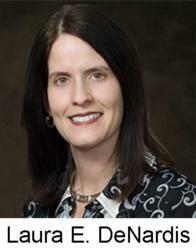 She has more than 20 years of experience in strategic Internet architecture consulting. During the fast-paced Internet growth years of the 1990s, she was the President of Internet strategy consultancy Atlantic Consulting Group and previously worked as a computer networking management consultant for Ernst & Young’s global information technology practice from 1989-1994. For more information please visit: http://www.cigionline.org/person/laura-denardis. The Centre for International Governance Innovation (CIGI) is an independent, non-partisan think tank on international governance. Led by experienced practitioners and distinguished academics, CIGI supports research, forms networks, advances policy debate and generates ideas for multilateral governance improvements. Conducting an active agenda of research, events and publications, CIGI’s interdisciplinary work includes collaboration with policy, business and academic communities around the world. CIGI was founded in 2001 by Jim Balsillie, then co-CEO of Research In Motion (BlackBerry), and collaborates with and gratefully acknowledges support from a number of strategic partners, in particular the Government of Canada and the Government of Ontario. For more information, please visit http://www.cigionline.org.